Accenting the positive… | What do self regulation and standards based education have in common? In my office I have a small leather plaque that simply states “IT CAN BE DONE”. I brought it with me when I transitioned from working with high school students to college preservice teachers. I am inspired by those who take charge of their learning and do not consider themselves victims of a system or unfair standards, accept the challenge and rise to meet it. There has never been a time where educators can impact positive change in our educational system as today. The common core comes with the opportunity to change the way we view the learner. The teacher in Brooklyn sees his classroom (made up of mostly immigrant non English speaking families) as an opportunity to teach life long learning skills, not teach to the test. It is possible to set up a learning environment where both effort and progress is encouraged and rewarded. It all begins with “I CAN”. It is his teacher efficacy that resounds “IT CAN BE DONE” that is reflected in the way he weaves into the learning experience the “how” approach to challenging activities. 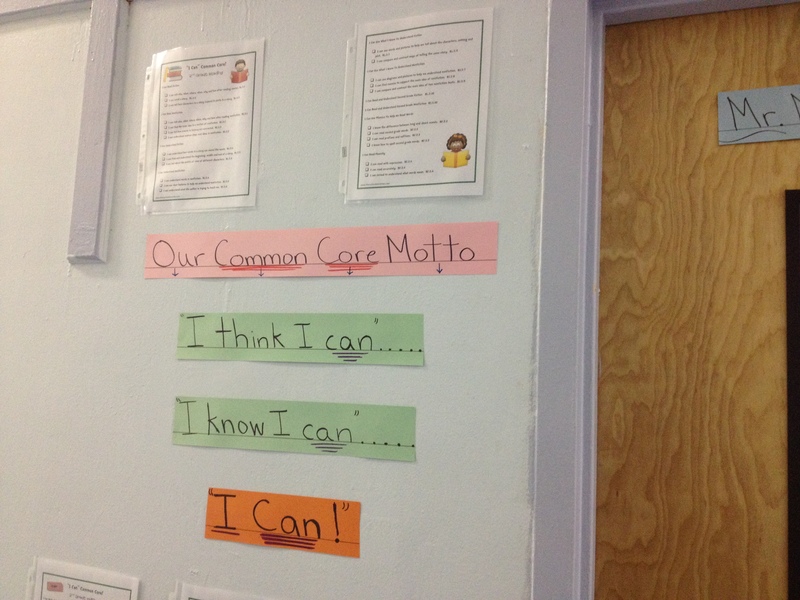 The common core encourages learners to take charge of their learning. Whether in a rural school in Idaho, a suburban educational setting, or an urban learning environment the common core can provide a framework to shape the learning independence of the next generation. In reality, we now have the opportunity to develop self regulation, which is key to becoming an independent and successful learner. Future blogs will explain more on this important strategy approach to learning. It all begins with teacher efficacy. Simply put, the teacher’s evaluation of whether or not his or her capabilities can bring about desired outcome to student engagement and learning is critical to the success of the common core. This includes working with those students who may be difficult or unmotivated. I see the common core as an opportunity to embrace change. “IT CAN BE DONE” should be our motto and as a result we will raise a generation of children who will be college and career ready.